Summary: Travis Strikes Again is a significant departure from the series with disappointing gameplay, but exceptional style. If I had to describe No More Heroes: Travis Strikes Again in a single word, it would be ‘strange’. And I don’t just mean strange in the way that all of series creator Suda51’s games are a a little ‘out there’. I’m referring to the bizarre design decisions that make Travis Strikes Again so monotonously repetitive to play, yet so utterly entertaining in every other sense. Travis Strikes Again takes place some time after the events of No More Heroes 2. 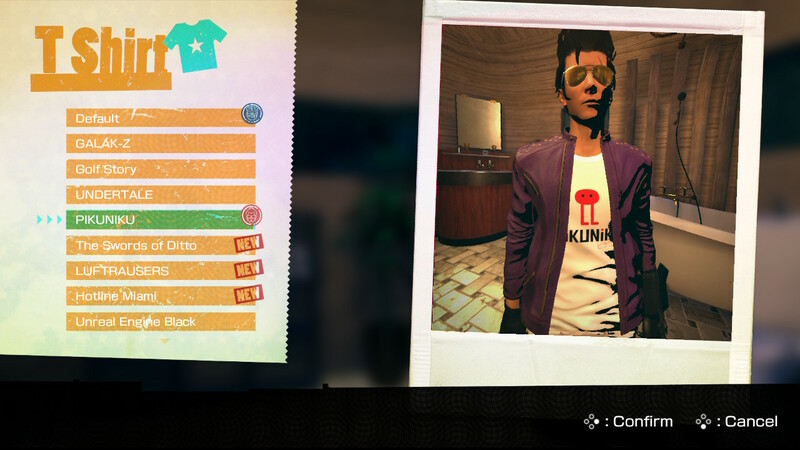 If you’re unfamiliar with the series, all you need to know is that our boisterous, Japanophile protagonist Travis Touchdown has been awarded the title of world’s greatest assassin by besting the highest ranked assassins across the globe. 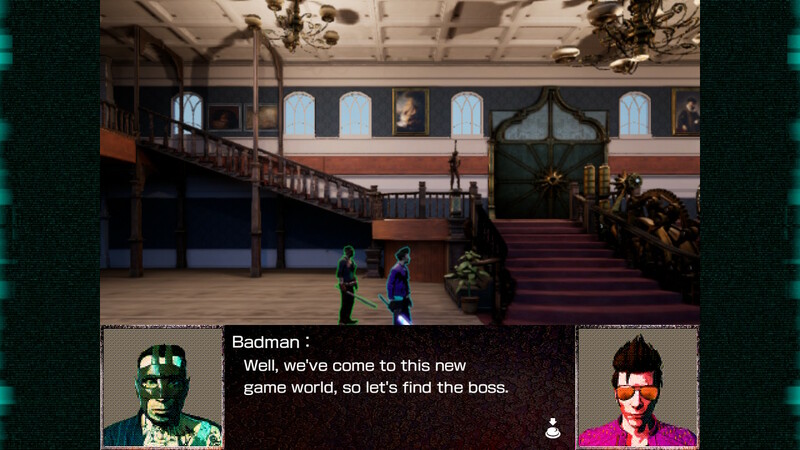 Travis Strikes Again opens with Badman, the father of Bad Girl (an assassin defeated by Travis in the first NMH game), seeking vengeance for his slain daughter by attacking Travis in his trailer in the woods. During the scuffle, the pair are mysteriously drawn into a magical video game console that has the power to grant a single wish to the player that defeats all six of the console’s games. The pair decides to team up and defeat each game in an effort bring Bad Girl back to life. In typical Suda51 fashion, the plot is completely ridiculous and nonsensical, but manages to engross the player by proving that you never know what’s coming next. Somehow the bar for ridiculousness manages to be raised with each successive plot point and although I couldn’t tell you exactly who each character in Travis Strikes Again is or what the overarching point of the narrative was, I thoroughly enjoyed the ride. Travis Strikes Again is broken up into numerous chapters, with each chapter revolving around a new game that Travis and Badman must complete. 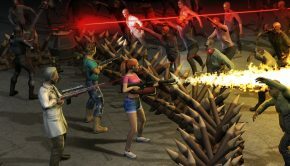 Each of these games have a unique aesthetic and progression mechanic loosely inspired by other well-known video games. For example, one of the later games takes place in a mansion that is aesthetically inspired by the first Resident Evil. In this game, Travis and Badman must scour the many rooms of the mansion for coffee and donuts in order to coerce a wandering spirit back to the physical realm. 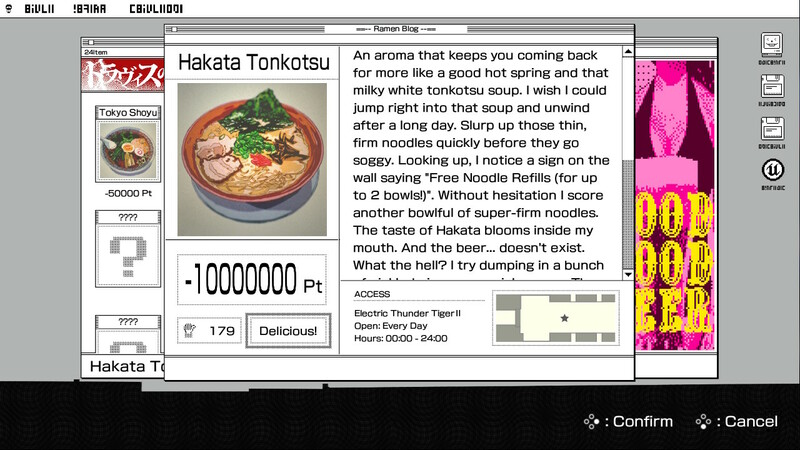 Each game world that Travis and Badman delve into has a similarly bizarre micro-narrative and by far the best part of Travis Strikes Again is unlocking new game worlds and discovering all the strange nonsense that comes along with it. Unfortunately, despite the unique aesthetics and progression gimmicks of each world, the actual gameplay loop is the exact same throughout the entirety of the adventure. 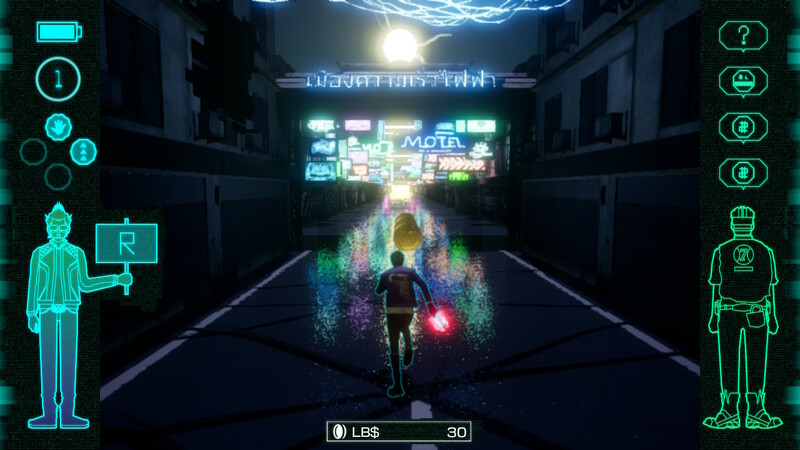 When it comes to gameplay, Travis Strikes Again is a significant departure to the third-person hack and slash gameplay the series has relied upon in the past. 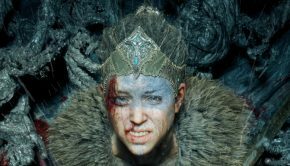 This latest instalment plays more like an isometric brawler, with the majority of combat encounters played from a zoomed-out, fixed camera perspective. With this new gameplay style comes a new combat engine – and unfortunately, the new combat mechanics are too simplistic and the combat scenarios too repetitive to be anything but a burdensome roadblock between you and the next dose of absurdity. 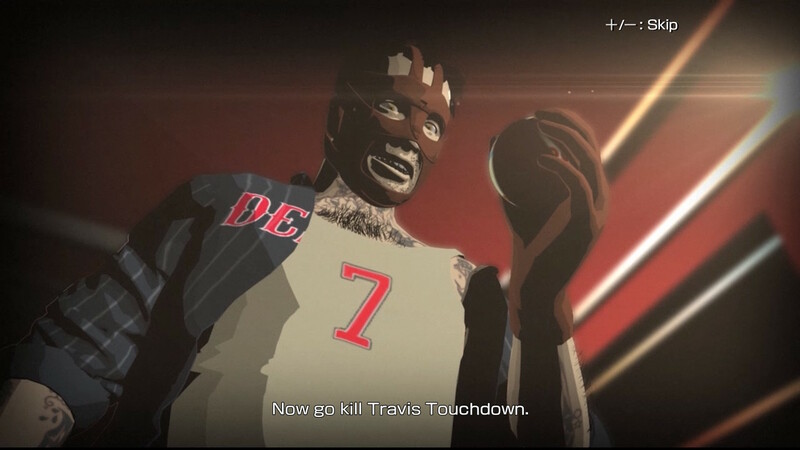 Travis Strikes Again can be played as a two-player cooperative adventure, with one player taking control of Travis and the other playing as Badman. As such, it’s clear that the level design and gameplay mechanics have been developed with this in mind. Each game world is made up of a variety of linear corridor levels with branching paths. As you move through these corridors, the path forward will constantly be blocked off as an arena suddenly forms around your character and hordes of enemies pile in. Defeating these enemies will remove the roadblock and allow you to move on… for a few moments. 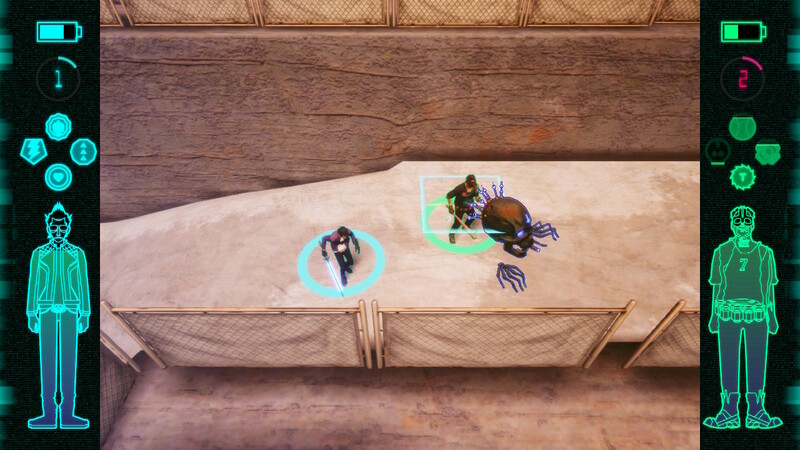 Then another arena will form and more enemies will spawn in. 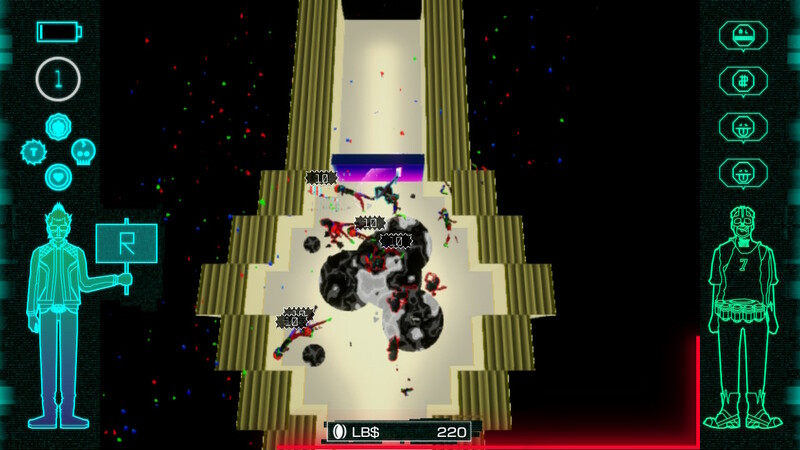 With two players, these waves of enemies are cleared fairly quickly and levels become rather breezey. Playing solo simply takes longer to clear all the enemies and highlights the tedious nature of the level design. 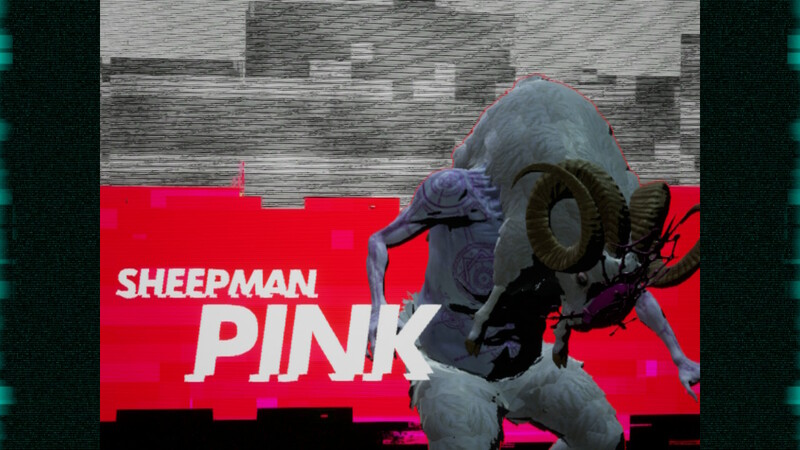 This cycle repeats ad nauseam until you reach the world’s midboss, which is always a gigantic sheep-man that poses little to no challenge on the regular difficulty. Then you will continue moving through the corridors, fighting waves of enemies until you reach the end boss. 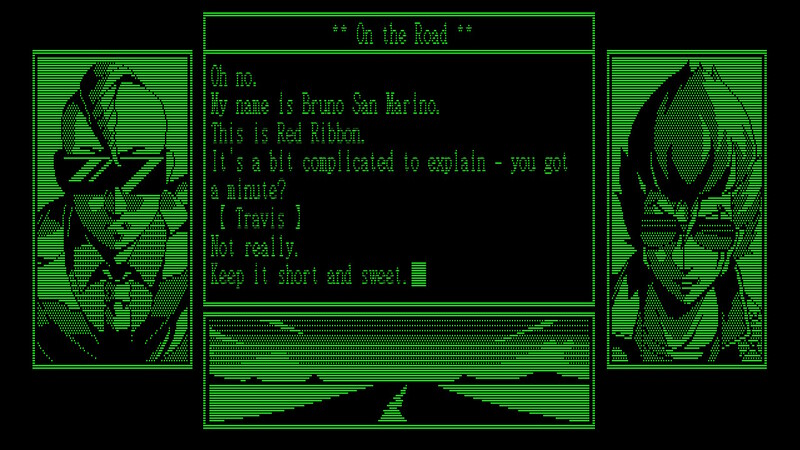 The end boss will be the protagonist of the game world that Travis and Badman have entered, and is always a challenging fight with a fun and characteristically nonsensical dialogue exchange at the end. 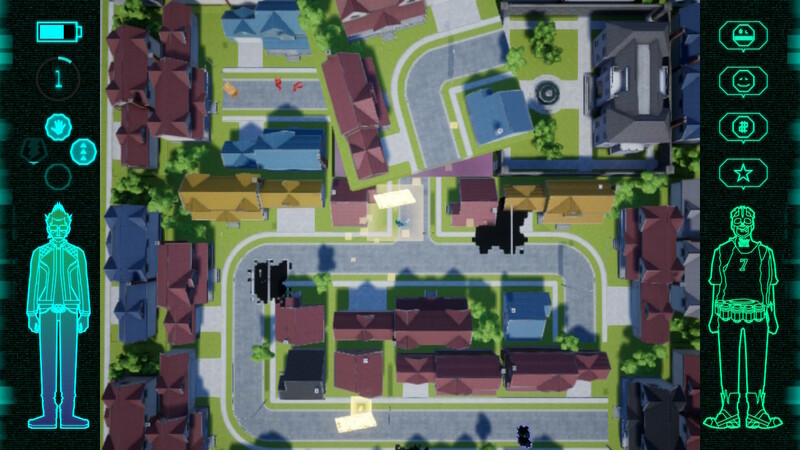 This is the general description for every game world with the only difference between games being the aesthetic design of the corridors to match the theme of the world and an occasional perspective change on the camera. The progression mechanic used to advance through the game world is also unique to each game, however these progression mechanics are heavily overshadowed by the repetitive corridor-confined gameplay. There are a few redeeming qualities to the combat of Travis Strikes Again that elevates the experience slightly above a total chore. There’s a surprisingly wide variety to the enemy types you’ll encounter throughout each of the game worlds, with many enemies requiring some form of strategy and pattern recognition to thwart. 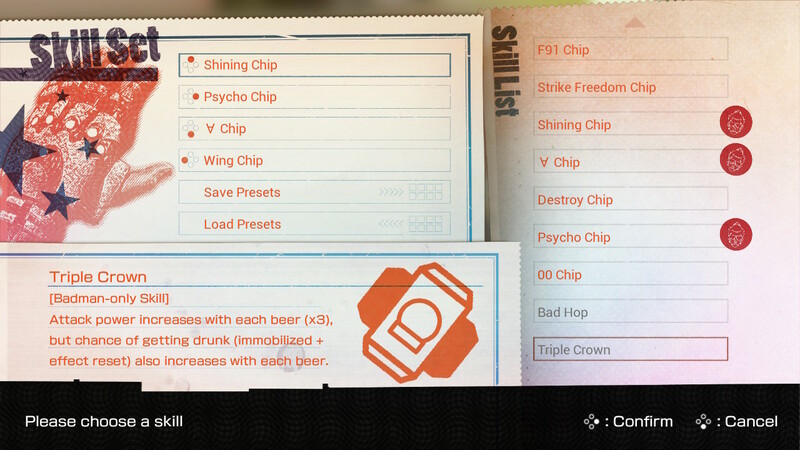 Plus there are a tonne of collectible skill chips to find throughout the levels that unlock a nice variety of combat skills that Travis and Badman can equip. Up to four of these skills can be equipped at once and each of them operate on relatively short cooldowns, allowing for a plethora of interesting combos and character builds. The fantastic soundtrack also goes a long way to distracting you from the tedium of the gameplay. The atmospheric electro beats pair perfectly with the onscreen action and the huge variety of tracks work well to match the eccentric tone of the narrative. A number of the more eclectic high-tempo tracks actually made their way onto my personal jogging playlist because they just have a great sense of energy to them. 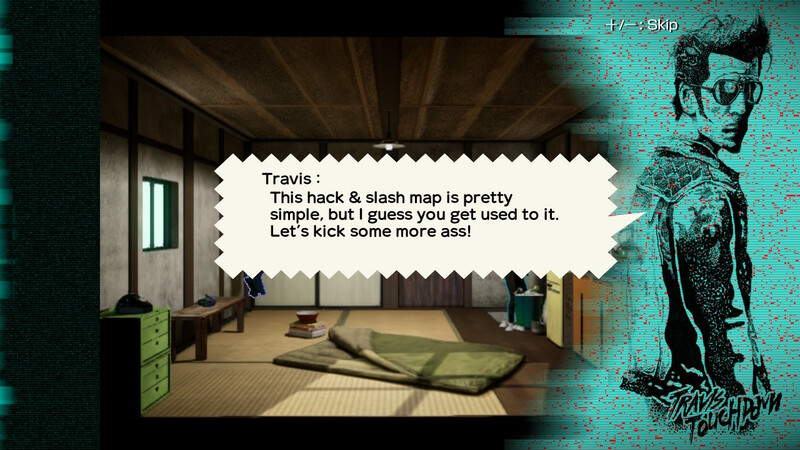 You’ve probably picked up on this by now, but I should make it clear, Travis Strikes Again is a very typical Suda51 game. 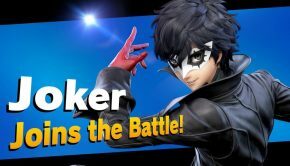 It’s filled with dumb, 4th-wall breaking jokes, its plot makes absolutely no sense and its gameplay is underwhelming – but it is absolutely bursting with style and personality. 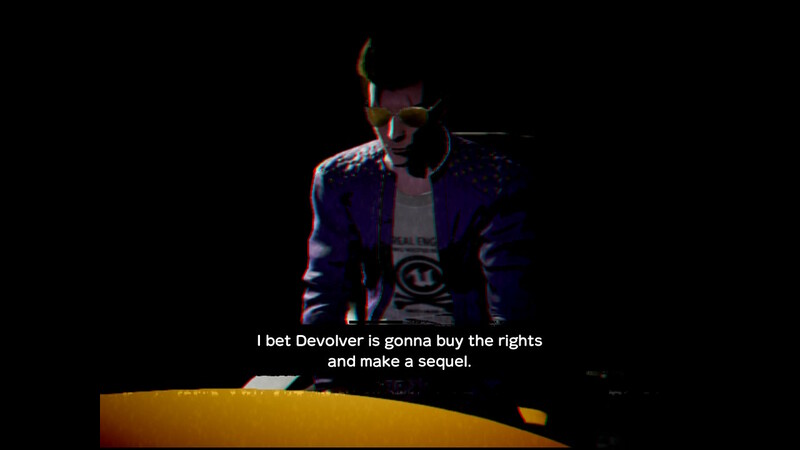 Despite the monotony of the gameplay, I quite enjoyed the nine-or-so hours I spent with Travis Strikes Again. If you’re a fan of Suda51’s previous work you’ll want to check this out. If not, I think the reduced price point is worth the cost of entry to behold the spectacle of absurdity at least.